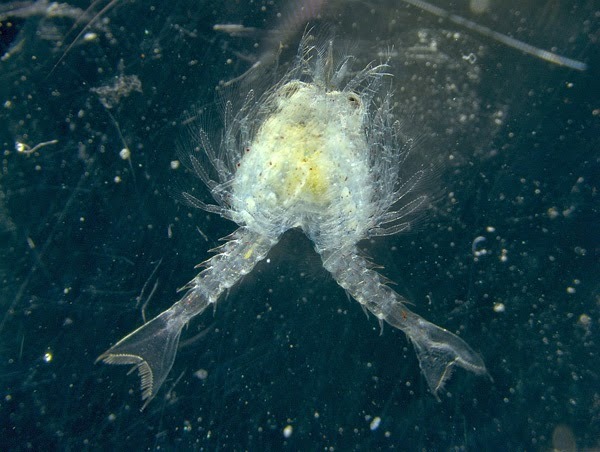 Recently Allison Langone, a summer intern with the New England Aquarium lobster lab, stumbled upon a very unique lobster larvae. Check out this newly-hatched conjoined twin! The conjoined larvae seems to be conjoined on its back side only. 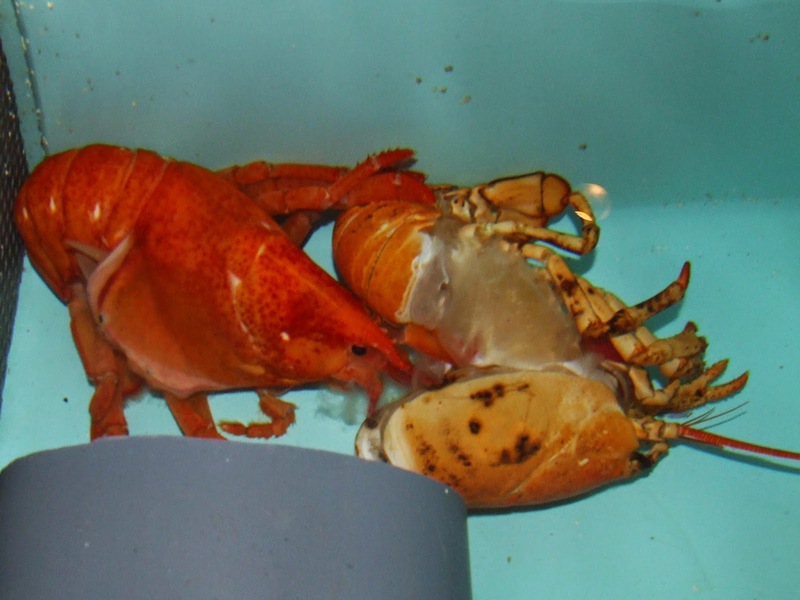 Each “twin” has a full set of legs, which is four pairs of walking legs and a pair of claws. 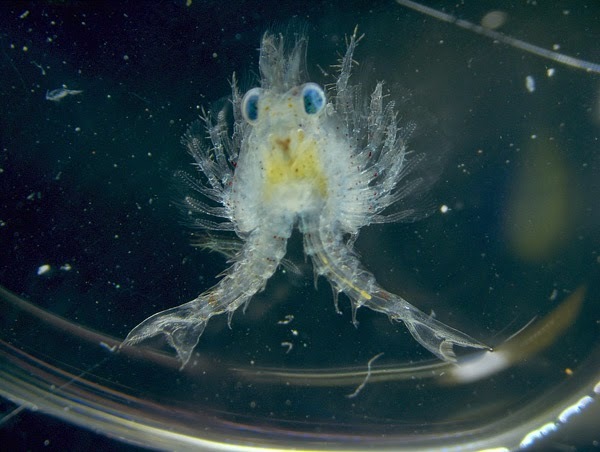 It looks like even more than the usual because larvae have extra appendages off their legs. It has two separate beating hearts. 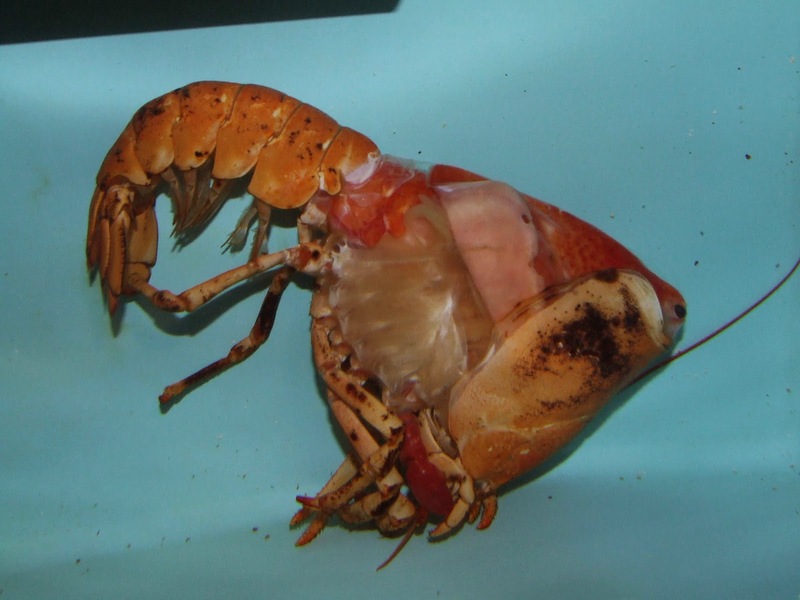 The intestinal tracts seem to function—you can see food in the right larva's intestine—though they seem to share stomachs (lobsters have 2 stomachs). These animals also share a set of eyes. Interestingly, the larva seems to swim fine. In its holding tank, it swam around a bit before heading down to the bottom. 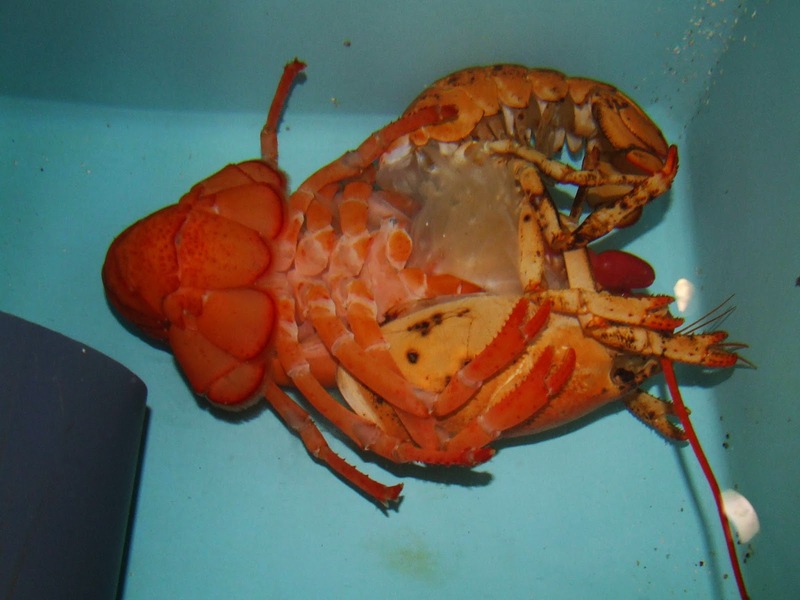 Even with special care, an animal like this is never expected to live long. This animal died after a week or so. 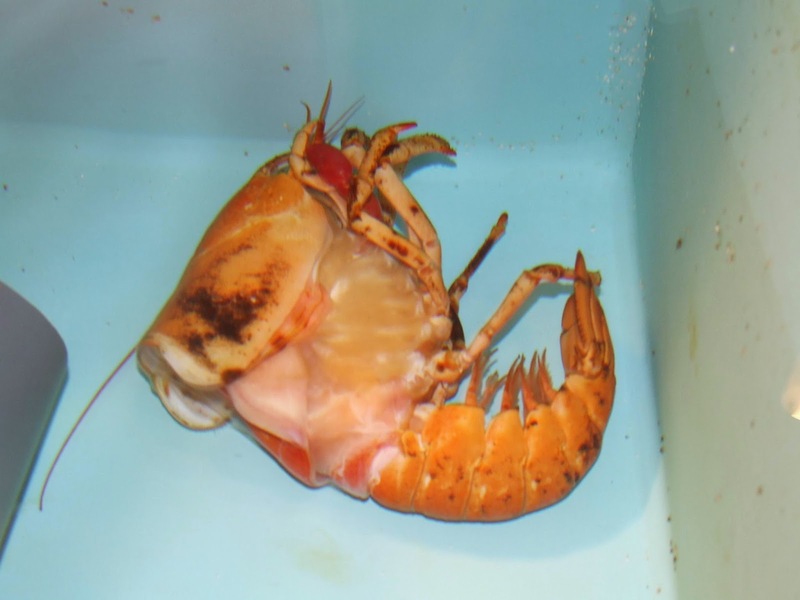 This unique lobster hatched in the Aquarium's research lobster hatchery—the last year-round U.S. production facility for American lobsters. 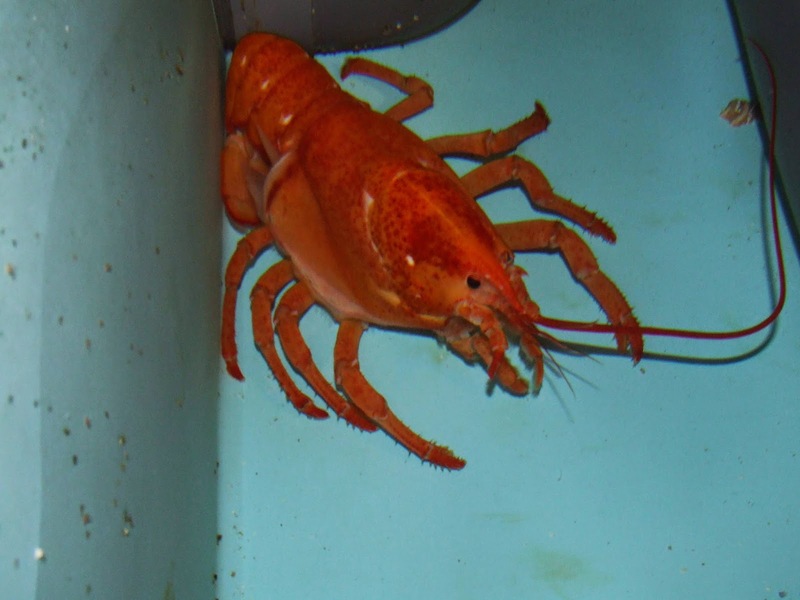 Our researchers are on the forefront of American lobster aquaculture research, investigating new and improved methods for raising lobsters in captive environments. 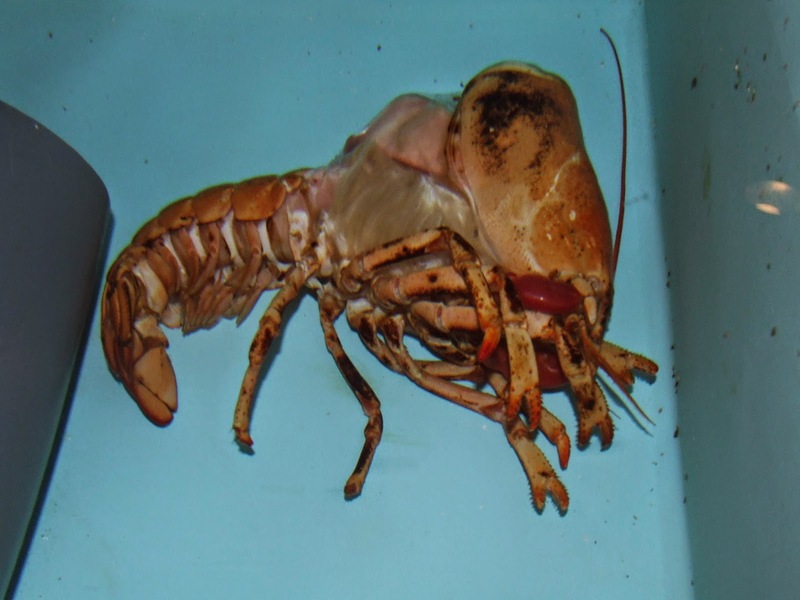 Our scientists are investigating nutritional requirements and pigmentation in captive-reared American lobsters. 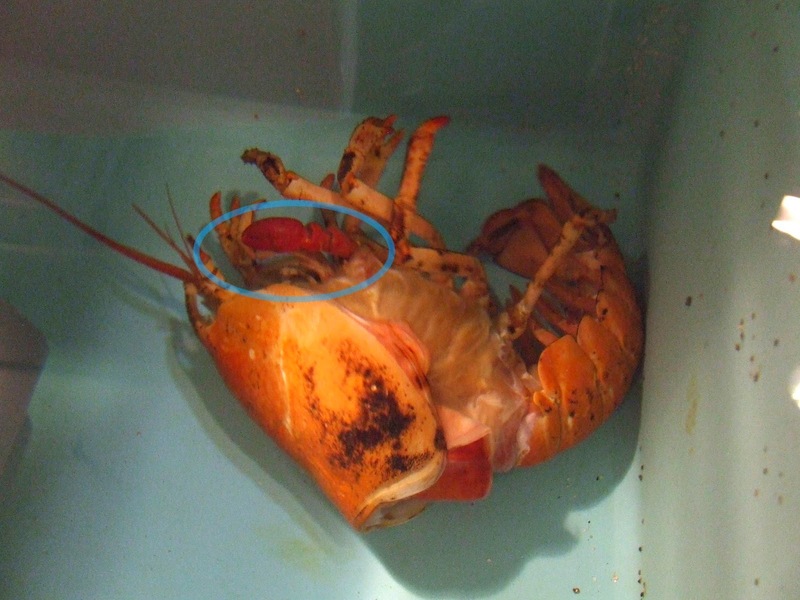 They are also collaborating with fishermen and scientists to develop a greater understanding of Lobster Shell Disease. Don't forget about the Caribbean spiny lobsters! 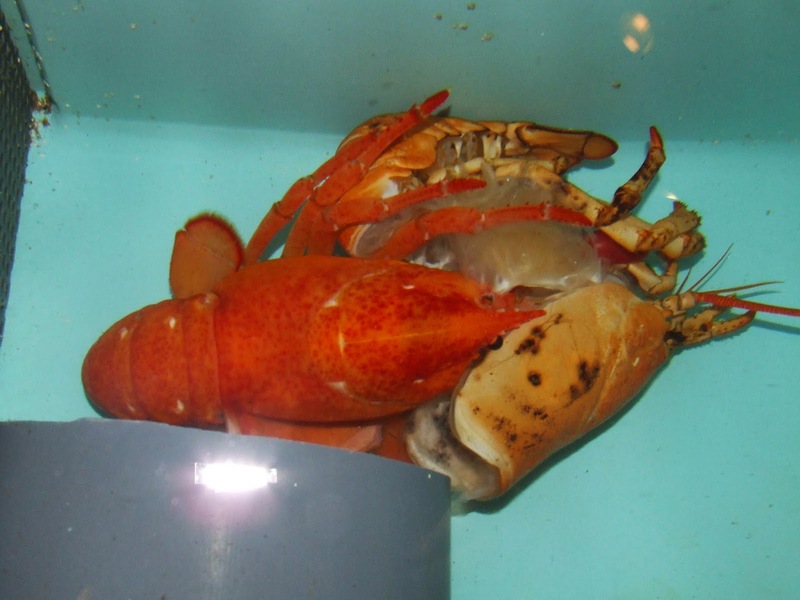 Now that you're all experts, come see traditional lobsters—with eight walking legs and a pair of power claws (one crusher and one pincer)! Plan a visit to the Aquarium! The Northern Waters gallery features several handsome adults scurrying around their cold-water exhibit. 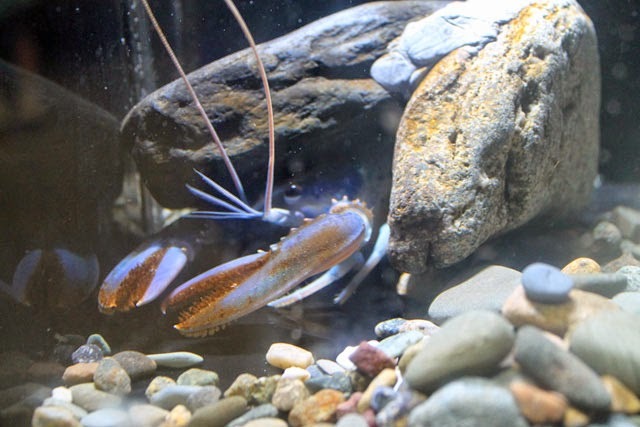 Look for wee juveniles in the lobster nursery at the Blue Planet Action Center. They're just tiny versions of the adults—complete with the unexpected colors! How do you feed a shark or a stingray? Very carefully! That’s a joke that we hear (and tell) a lot at the Trust Family Foundation Shark and Ray Touch Tank. And while it might be a joke, feeding our animals is something we take very seriously at the Aquarium! Everyone looks forward to breakfast! The topic of feeding (and eating!) comes up a lot throughout the Aquarium. It makes sense—eating is one of those universal things that all of us organisms need to do. 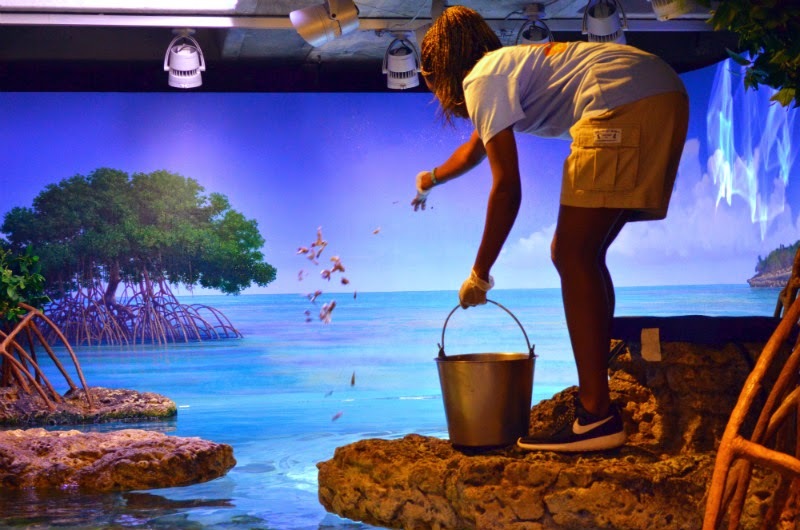 With over 100 animals in the touch tank, visitors often are curious to learn how we feed so many animals in one place. The first question many people ask is what do we feed the animals in the exhibit. Fortunately, all of the different species of sharks and rays eat the same types of food. So what’s on the menu? 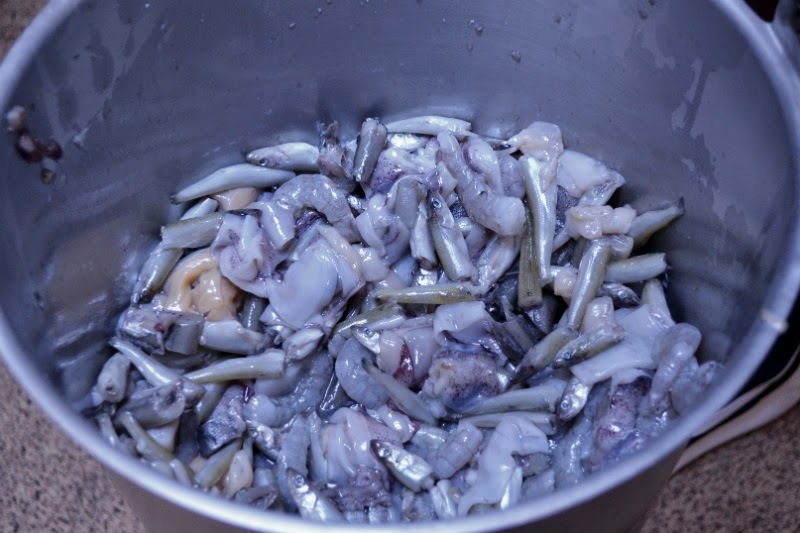 Mealtime usually includes squid, small fish, clams and shrimp. The diet is prepared first thing in the morning and then fed to the exhibit throughout the day. As feeding time arrives, food is simply scattered on the sandy bottom of the exhibit. Both sharks and rays will cruise over the sand, picking up pieces of food as they go. To ensure that everyone has the opportunity to get something to eat, the exhibit has food added to it a couple of times a day. But the animals never know when it’s coming—we change the times slightly each day to keep them guessing! As the food sinks to the bottom, animals come from all over the exhibit to the two main sandy areas. Even those animals that usually hide during the day, including the sharks, will come out for a snack! In a flurry of fins, tails, and mouths, the food is gone in no time! With a keen sense of smell, these animals can locate their prey easily. And as their mouths are located on, or near, the bottom of their body, scooping up food from sand is no problem. 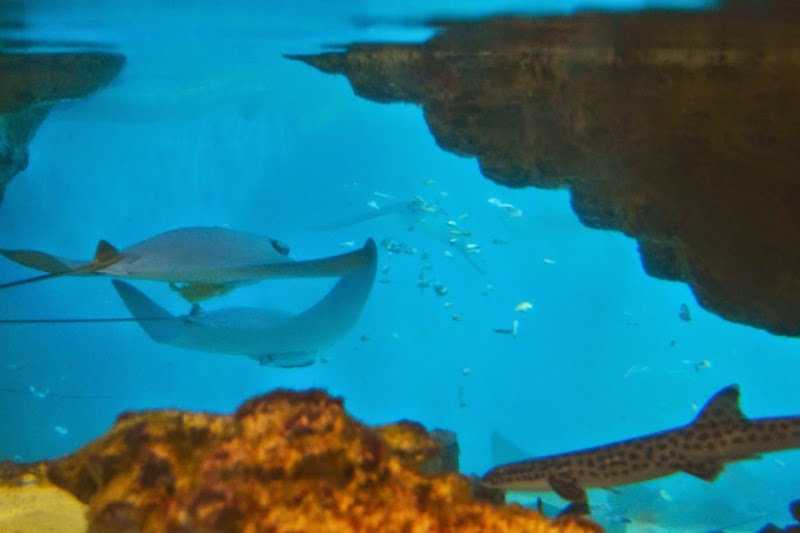 Both the rays and sharks will eat when they are hungry, so it's possible that every animal might not eat at each meal. But with feedings happening throughout the day, everyone has the opportunity to find a yummy snack when they want one. 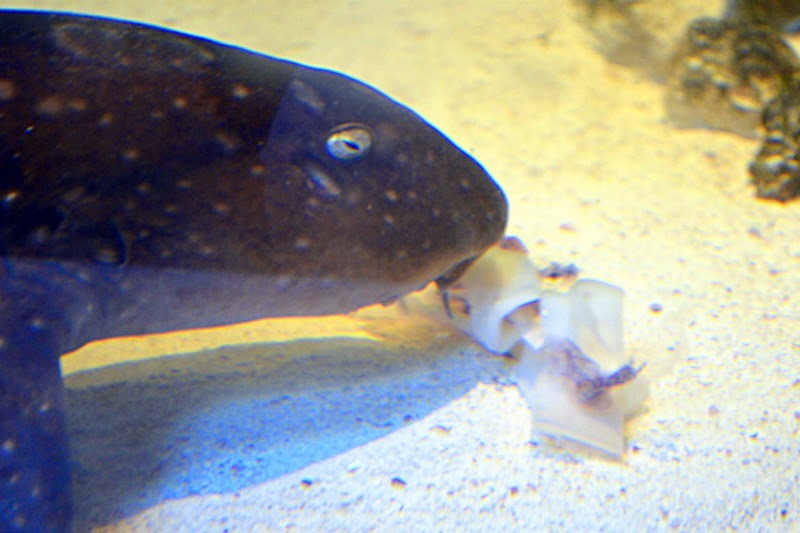 A white-spotted bamboo shark and her squid snack! 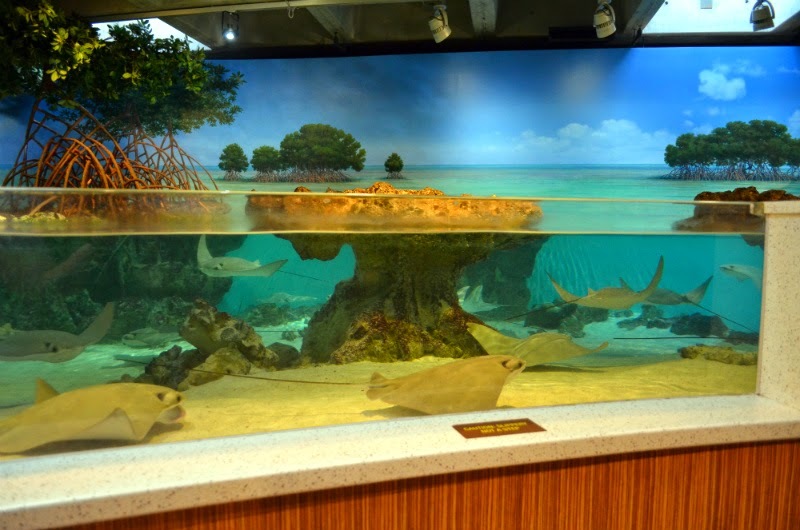 Perhaps next time you visit the Aquarium, you might just be in time to see the shark and stingray touch tank exhibit animals get something to eat. Consider buying your tickets online and printing them at home so you can zip in the door when you arrive. Here's where to start planning your next visit! 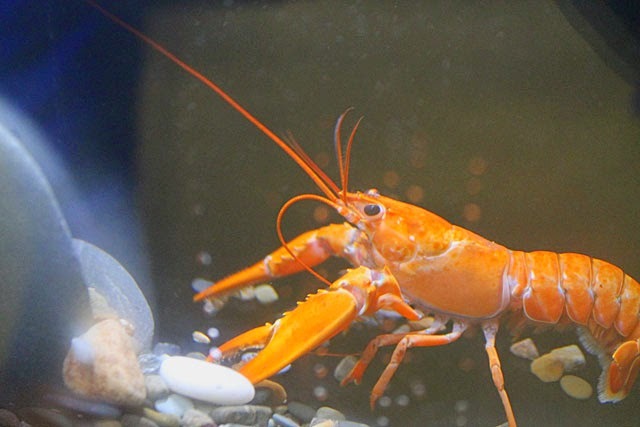 And in case you're hungry for a snack of your own, head over to the New England Aquarium's website for environmentally friendly seafood options and seafood recipes. Bon appetit!